Improve your hospitality and tourism research abilities with this impressive collection of research methods! The Practice of Graduate Research in Hospitality and Tourism assists you in gaining insight into different facets of research design, conceptual development, research methods, and conclusions drawn from research in hospitality and tourism. 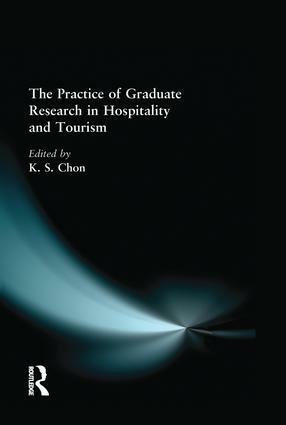 As a professional, researcher, or graduate student in the hospitality and tourism field, you will benefit from this collection of chapters that represent examples of research trials conducted by graduate students in hospitality and tourism and are selected on the basis of the originality of the students’concepts, research methods, and interest of the work to graduate students. This informative volume will provide you and your students with up-to-date and effective ideas for researching topics within the field of hospitality. The Practice of Graduate Research in Hospitality and Tourism is an excellent supplemental textbook for research methods classes in graduate hospitality and tourism programs. The wide variety of chapters will stimulate discussions on research in hospitality and tourism from conceptual, secondary data, and primary data approaches. The Practice of Graduate Research in Hospitality and Tourism serves as an important forum for initiating research and new ideas internationally. The carefully selected chapters of this essential text will provide you and your students with suggestions that will improve research competency as well as hospitality services to patrons. HIV and AIDS in the Workplace: Do Future Hospitality Managers Have Adequate Education?